we’ll take a nostalgic look back at some history of our group. From an original group of about 16 railfans that in 1938 met weekly, to a year later being affiliated as the Buffalo Division of the Railroad Enthusiasts, the Chapter we know today grew into one of the largest in the NRHS. In 1942 it changed affiliation to the then new and upcoming National Railway Historical Society, receiving the 17th Chapter charter. The membership roles stood at 26. Before the coming of U.S. involvement in World War II, the “Enthusiasts” would meet in the home of founder Russell H. Shapley. Mr. Shapley was a collector for a credit clothing store and a resident of Buffalo’s proud, working class East Side. A naturally friendly, outgoing “people person”, his employment put him in contact with many then current and former railroad employees who lived in the densely populated neighborhoods close to the tracks that dominated Buffalo in the early to middle years of the 20th Century. Mr. Shapley quickly became the strong and dedicated leader of that group of like minded individuals, all with a passion for railroads. In 1939, Albert D. Kerr, Charles A. Erler, Lawrence Burke and Harold Ahlstrom appeared on fan trips sponsored by the group, and within a year all were members. Mr. Shapley, John Prophet III, Albert D. Kerr and Charlie Erler became the charter members of the Buffalo Chapter, NRHS when in February 1942 official acceptance into NRHS was granted. Early meetings of the Chapter were held on the first Friday of the month, in the Assembly room of the Lehigh Valley RR terminal on lower Main St. in Buffalo. And many excursions out of this Terminal led to what we would now relish as exotic destinations by rail! From the start, even before NRHS, fan trips were a staple of the group’s activities. Starting with a highly successful trip to Cleveland via the New York Central in May 1938, the group then ran a month later a special over the Arcade & Attica. That summer would be busy. July saw a trip on New York Central to Westfield, NY with a charter over the electrified Jamestown, Westfield & North Western (nicknamed by fans as the “Jesus Wept and No Wonder”!). Such exotica was followed by more “electrifying” mileage in Canada on the cars of the Niagara, St. Catherines and Toronto interurban. October featured special coaches out of Buffalo on the Pennsylvania RR to Emporium and return. 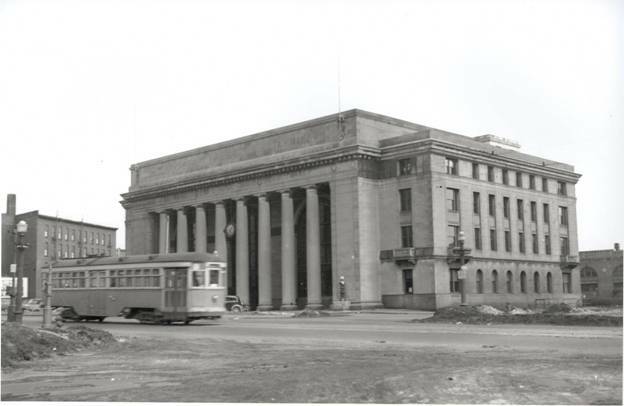 By 1939, regular meetings had outgrown Russ Shapley’s living room in his home at 178 Box Avenue, and were being held in a room at the Lehigh Valley Terminal on Main St. in downtown Buffalo! The group was “off to the races”, and membership was increasing. The first “annual dinner” was held on Sunday, June 4th 1939 in Arcade, NY. This day consisted of a morning departure special over the Erie RR on train no.2 out of the Lehigh Valley Terminal in downtown Buffalo, to Attica, NY where an A&A special was waiting for the group. After a leisurely trip to Arcade, a festive lunch was held at the Hotel Arcade with a program put on by Mr. Charles Bowen, Erie Railroad agent at Castile, NY, known as the “Will Rogers of the East”. After dinner, there was time for photographic opportunities in the A&A enginehouse and at 5:15 PM a train was boarded for a trip to Arcade Junction and a quick across the platform transfer to Pennsylvania RR train 571 for Buffalo’s Central Terminal. More trips that year repeated the successful Westfield and JW&NW trip, another A&A trip on August 13th, and what must have been an absolute delight, a September 2nd departure on the Lehigh Valley RR for New York City and the 1939 New York World’s Fair. Separate returns were allowed for the group, all at a rail fare of $11.25! Wow! In May, a Michigan Central train was ridden to Detroit, featuring “Special Deluxe Observation coach and Dining car service going and returning.” In Detroit, the group was given a private tour of the famous streamlined New York Central Mercury, which operated between Detroit and Cleveland. And after that, a visit to Wabash and Pere Marquette enginehouses was arranged for those who just could not get enough of steam! And the Pennsylvania RR also serviced its locomotives at the PM house in those days, too! June 1940 saw another A&A trip, a “gondola trip” where the fans could ride the open car. “Complete round trip fare from Buffalo, $3.00”. In July a trip over the Delaware, Lackawanna & Western from Syracuse to Binghamton was arranged, and just a week later, “juice fans” boarded a special of the Niagara, St. Catherine’s & Toronto”. The flyer stated “This may be our last opportunity to ride this most interesting line”…. the N St.C & T has recently applied for permission to abandon passenger service.” More trips later that summer rode the B&O car ferry out of Rochester across Lake Ontario to Cobourg, Ont. A Labor Day Altoona, PA trip via the PRR was a hit with the club. NYC 4-6-2 #4750 is on the point with an excursion over the New York Central “Peanut Line”, July 21, 1946. And so it continued, those early years were filled with fan trips and enthusiast meetings. Buffalo was alive with railroad activity, and the railroads embraced their fans. With the coming of the War, trips were severely curtailed, but a few things still managed to be run, albeit always in regular service trains and where the fans could stay under the radar with camera / photo opportunity restrictions. It was reported that the fans were “marking time” and contenting themselves with “ersatz railroading” by “getting together to view motion pictures made on many of their famous trips over bumpy roadbeds behind puffing, creaking old locomotives.” But membership continued to grow, and by 1944 stood at 50. With the war ended in 1945, the group soon began planning for a new round of trips. But tragedy struck; within a year Russell H. Shapley, the man who had led the group since its inception, was dead of a heart attack on October 16, 1946. But before Mr. Shapley’s untimely demise, the group would operate one of its most famous trips over New York Central’s “Peanut” line on July 21, 1946. Operating from Buffalo, over the Belt Line to North Buffalo Jct, Falls line to North Tonawanda, and then Peanut east through Tonawanda Junction to Batavia via Getzville, Clarence Center, Pembroke, and East Pembroke and continuing to Caledonia. There the trip reversed direction and returned to Akron Jct. where the special was routed over the West Shore via Clarence (Hollow) back to Buffalo Central Terminal. The trip flyer noted the bargain fare of just $3.20. Mr. Shapley ironically wrote a wonderful letter to the membership just a few weeks before his death, extolling the Chapter’s trips and all the activities, including the ever more popular national conventions of NRHS. The Chapter would survive, grow and prosper throughout the late 1940’s and into the early 1950’s. New leadership moved to the forefront with the names of John Clark, Harold Ahlstrom, William Kessel, John Prophet, Richard Ganger, and Albert D. Kerr becoming more prominent. The Chapter was in a race to cover the changing rail scene. Steam locomotives began their twilight years of service as more and more diesels arrived every day. Railroads, although still very much in the passenger business, were changing. The days of having virtually unlimited options to choose, were diminishing. Still, many memorable excursions were sponsored, especially autumn leaf-peeping sorties into Pennsylvania, and electric trips over the still in service Canadian interurban operations. 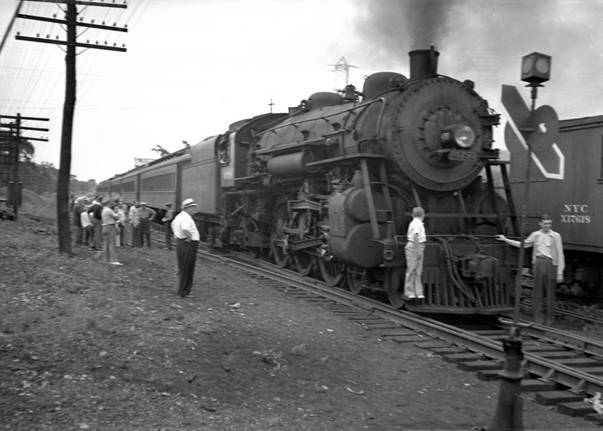 At mid decade on June 26, 1955 an especially neat trip was arranged over the Erie RR to Jamestown, with a connection to the coal fired Chautauqua Lake steamboat “City of Jamestown”. The last runs of Nickel Plate Road steam on the racetrack west of Buffalo were frequently observed from a trackside picnic grove at one of the member’s homes, and a late decade trip behind a NKP Hudson out of Buffalo’s DL&W station to Cleveland is now legendary. National conventions increased in attendance and scope in such places as Roanoke, VA, noted by David P. Morgan, editor of Trains, as “the Alamo for Steam”. NYC Hudson 5238 races west at Athol Springs with a mail & express train in the early 1950’s. Canadian steam excursions replaced those south of the border where steam had disappeared by the end of the decade. It must have been both a sad time to see the demise of the traditional “iron horse” but also exciting as new streamlined passenger trains debuted on many railroads. But the bloom was soon off the rose, the genie was out of the bottle with automobiles on new superhighways of the Eisenhower era. Air travel was eclipsing once convenient and plentiful passenger trains. The glory days of regularly scheduled passenger service were numbered. Throughout the 1960’s the Chapter still managed a busy, if more routine existence. Programs and photography were always important, but the Chapter also had a book lending library, and where ever possible, jaunts on regularly scheduled trains, especially in Canada would continue. Steam excursions saw a brief but glorious revival in nearby Ontario with engines such as CNR 6218, and CP engines on the Credit River. In the U.S., the Iron Horse Rambles with locomotives like Nickel Plate 759, Reading 2102 and the Golden Spike special made excursion history. The Chapter was a key participant in the Southern Steam program of the mid 1980’s which brought engines such as the beautiful streamlined Norfolk & Western 611 and the massive N&W 1218 to Buffalo. NKP 765 returned to service in the mid 1980’s too. Many summer excursions along the former NKP to places like Girard, PA, Conneaut and Ashtabula, OH kept the flicker of a steam heritage alive. 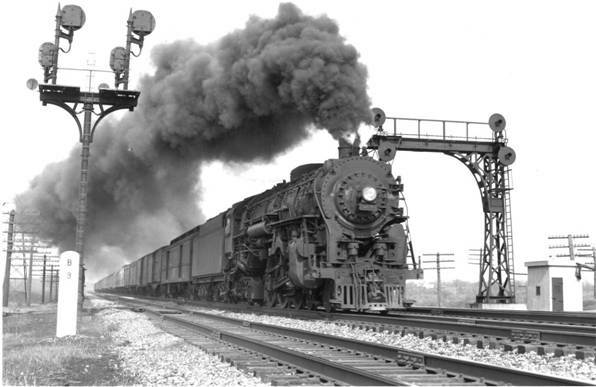 NRHS National conventions featured multiple “big steam” locomotives. By the early 1980’s the membership was changing, as is only natural with age. Some were interested in more than railfan trips; a permanent home and museum project discussion began to gather momentum. The Western New York Railway Historical Society was formed in 1980 mostly from former Chapter members who desired an immediate change in direction towards preservation, and the divide was painful. But, in 1987 the Chapter itself acquired the former Erie RR freight house in North Tonawanda, NY along with the adjacent EL2 interlocking tower, a landmark RR structure, one of only a handful left in New York State. A long restoration process was begun, with the goal of an operating museum dedicated to western New York and nearby railroads. Geoff Gerstung had by now become Chapter president and provided the leadership which brought this project into a reality. Years before, Geoff had established the Chapter in the annual railroad calendar fund raising project that featured high quality historic and current photography of western New York and Southern Ontario rail scenes. Of course many, many individuals assisted in this endeavor, but space does not allow us to name each and every one. Geoff’s untimely passing in 2000 left a huge void in the Chapter, which just a few years before lost several of the “old guard” leaders such as Al Kerr and Harold Ahlstrom, as well as many of the other long time members who had stepped aside from leadership roles. Gradually new leadership came to the forefront. The Chapter has moved on into the 21st Century, recognizing its heritage and mission. The museum improves each and every year with restored equipment, ever improving and expanding displays, and archival materials. Seventy-five years is a lifetime, and then some, for any organization. The challenge we face today is to be able to pass the legacy along to a new generation of railfans which sadly are few and far between. Declining membership is a fact facing ours and nearly all rail historical societies in the 21st century. Will the legacy survive? It’s up to us to see that it does. Milepost 58 in Westfield, NY is still a great train watching location on the former New York Central Water Level Route of today’s rail giant CSX. 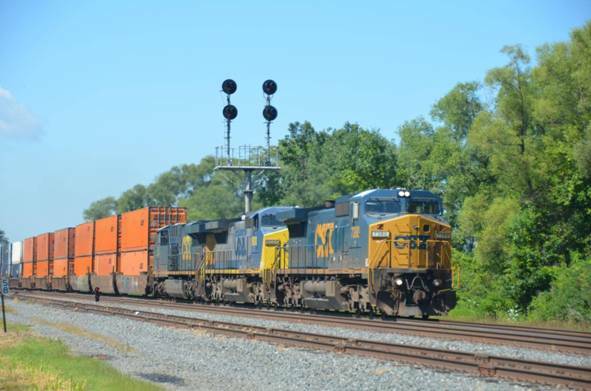 A hot footing stack train races eastbound to Buffalo on July 31, 2015 past a signal mast with NYC heritage indicators. Even though the glory years of Buffalo railroads may seem to be all but obliterated, as I write this, a diesel air horn has just sounded in the distance on the old New York Central, now CSX’s Niagara branch. The roar of a freight climbing the grade northbound to Niagara Falls and the squeal of steel flanged wheels rolling over the heavy curving steel rails of the Tonawanda cutoff fills my ears with welcome sounds on a cold winter night. We also still luckily have some passenger service today with Amtrak, and it is always a treat to ride the Water Level Route or beyond whenever possible. And steam, glorious steam, can be found on special excursions on the High Iron occasionally and in many railroad museums that are fortunate to be able to operate some trackage. And don’t forget, the Arcade & Attica still operates a popular steam locomotive excursion just a few miles from Buffalo each tourist season. Steam and vintage diesels draw huge crowds of admiring fans and the curious when they operate. The magic of railroading is still there, that magic that Russ Shapley and many, many others first recognized more than 75 years ago and organized as a group of friends to share. It is certainly there for those of us who know how to listen for railroading’s call.